The Milwaukee 7-1/4 in. Worm Drive Circular Saw provides the power contractors demand innovative features designed to make their jobs easier. The 15.0 amp, 4,400 rpm motor delivers maximum cutting performance and does not bog down, even under heavy loads. Hardened steel worm gearing provides maximum torque in the toughest applications. Magnesium construction makes the saw both durable and lightweight. The composite shoe will not warp, bend or kick up a burr. The exclusive oil site glass makes it simple to quickly and accurately check the current oil level of the saw. 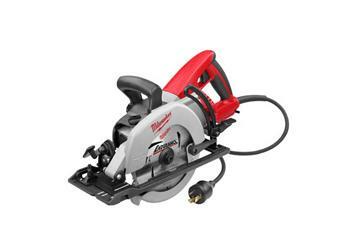 15.0 Amp, 4,400 RPM Motor- delivers maximum cutting performance and does not bog down, even under heavy loads. Hardened steel worm gearing- provides maximum torque in the toughest applications. Depth of Cut at 90 0 - 2-7/16 in. Depth of Cut at 50 0 - 1-9/16 in. Capacity at 45° 1-3/4 in. Depth of Cut at 45 0 -1-25/32 in. Capacity at 90° 2-3/8 in.